The man who runs Opononi Beach Holiday Park is a no nonsense kind of guy. He knows how he likes things done and he isn’t afraid to tell you. This can include giving specific instructions on how to park your caravan. Fortunately Mike was behind the wheel and he knows what he’s doing, if I was in the driver’s seat I’d be telling a different story. Once the caravan was parked exactly where the owner wanted it to be, he rode off on his motorbike leaving a trail of awe behind him. 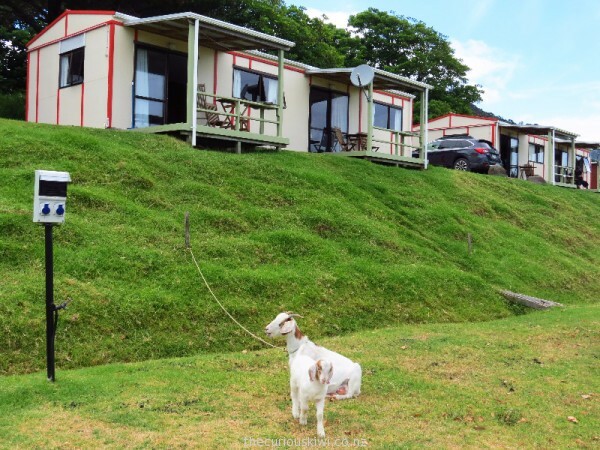 While the owner is no nonsense, the holiday park is no frills. I don’t think the communal facilities have changed much since they were built years ago. I couldn’t have cared less as we’d just spent a few days at a place that had unisex bathrooms. It only took a few seconds to know that the only guy I want to see without a shirt in the bathroom is the one I’m travelling with, it was too much visual information and uncomfortable intimacy for me. I thought about kissing the ground outside the womens bathroom in Opononi but that would have been weird. While the bathroom is basic it’s kept clean, and when the weather is warm, and everyone is kicking back on summer holidays it’s all you need. What we loved about the holiday park was the view out to the water and the giant sand dunes beyond. You can catch a boat over to the sand dunes and go sandboarding with Hokianga Express Charters. 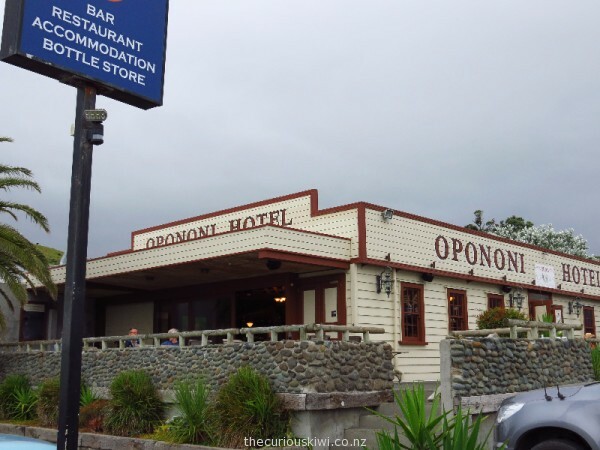 The holiday park is also a short walk from Opononi Hotel, The Landing Cafe, a fish ‘n’ chip shop and Four Square (small supermarket) so if you don’t want to cook you’ve got options nearby. We didn’t use the kitchen at the holiday park but there are a couple of kauri tables and long stools on the deck, it’s a nice spot to chat to fellow campers. Goats are a cute addition to the park and silently keep the grass down. Cabins are at the top of the hill and have the best views. 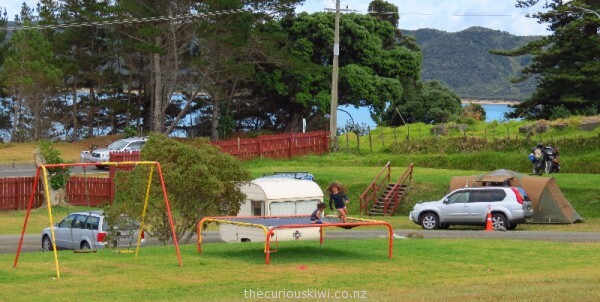 Opononi Beach Holiday Park – no nonsense, no frills, and no complaints from us. 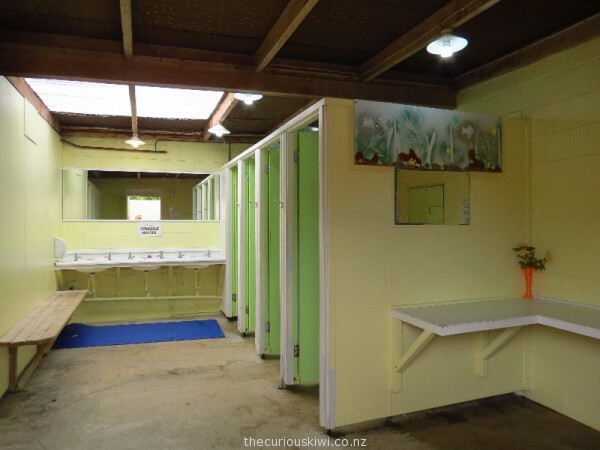 This entry was posted in Bay of Islands/Northland, Holiday Parks and tagged Opononi Beach Holiday Park by thecuriouskiwi. Bookmark the permalink. Goats need more than just grass they are a browser . Tethering them is not a kind practice for these guys and where’s the water for them ! I know a little bit more about goats today than I did yesterday thanks to your comment and Google. I read that tethering goats happens often in NZ, although that doesn’t necessarily make it right. Obviously I don’t own the holiday park or the goats and don’t know the details around their care, but you could contact the owners if you want to. I do know now though that if I ever get a goat, or know someone that does, there is some useful info on the SPCA site about caring for them.